Job profile for a Junior Designer- we do not currently have a job profile for this role on site, if you are able to write one then please Send it to us - you will be fully credited on site. If you are a Junior Designer and you would like to share your current salary with us just like hundreds of other professional workers do every day, please do so with our salary calculator. In 2008, the average salary for this job was £22,500. The average salary in 2009 was £26,829, based on 21 respondents (a difference of 19% from the 2008 figure. 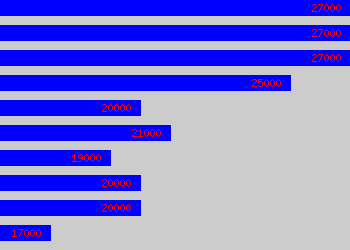 The average salary in 2010 was £20,034, based on 41 respondents (a difference of -34% from the 2009 figure. The average salary in 2011 was £19,520, based on 43 respondents (a difference of -3% from the 2010 figure. The average salary in 2012 was £19,194, based on 17 respondents (a difference of -2% from the 2011 figure. About the Salary Survey Data in this survey is based on over 368,000 individual salary records. The date period for which job information was gathered varies, but is usually between 2008 - 2012. For precise date related information, custom reports may be ordered with greater granularity. Working 8 hours a day, 250 days of the year, the data suggests the hourly rate for Junior Designer is £11.31. With regard to age and impact on salary for a Junior Designer, a statistical average weighting (that is based on how salary varies by age and not for a specific job which may vary considerably) suggests these figures: £16,967 for a worker in their 20s, £22,170 (30s), £26,242 (40s) and £26,242 (50s). The average salary figure above for a Junior Designer is considered highly likely to be representative of the UK market average due to the high number of respondents who had this exact job title.